Computing technology keeps on advancing and there is no stopping that. If you look back on the technology available to us ten to twenty years ago, they definitely pale in comparison to what we have now. Not only do computers look cool and sleek (industry groups like IEEE have helped with this) they can do various functions too, all at once and the storage is the icing on the cake. Most files have gone digital and we need a sturdy and big enough hard drive to store all our important files. While computers and other computer-related accessories are still somewhat expensive, their efficiency has more than doubled over the years. Almost everything that you need requires the hard drive to work and we need them for storage of non-volatile memory that we happen to need the most. Most modern laptops and computers still rely on mechanical hard drives to do the job for them but DNA-based ones will probably rule the future considering that experts are grooming artificial intelligence to dominate the future. It isn’t only the junk processor that makes a really cheap computer slow. Or the memory or the video card (or lack of video card). The primary reason your cheap laptop loudly chugs along at glacial speeds is because of the hard drive. Cheap laptops use cheap hard disk drives, which are much slower than the solid state drives found in better computers. But Intel’s new Optane Memory changes that. This little $70 chip makes a cheap hard disk drive run as fast as a solid state drive. It does all this by using a brand new type of memory. That sounds very boring, but memory might be one of the most important components in your computer. What the hell is memory? Memory is anything in a computer that reads and writes data. There’s memory in your processor, in your RAM, and all the way down to your USB drives. “It’s like a pyramid,” Greg Schulz, a storage analyst and operator of StorageIO told Gizmodo. “As you go down the pyramid the capacity is cheaper, but slower.” So the tip of the pyramid is the memory in your CPU, then comes DRAM, then NAND-based flash storage like SSDs, then hard disk drives. At the very bottom would be the oldest and cheapest kind of memory tape drives. Speed and reliable storage solutions are the names of the game right now. Computing devices can now perform a myriad of processes, so it needs a powerful hard drive to keep up with everything your computer can do. And thanks to competition, prices have considerably gone down without sacrificing quality. Unfortunately, no matter how advanced or sophisticated your hard drive is, it is still susceptible to cyber attacks by cyber criminals who are after your data to make lots of money. On Friday 12 May and over the weekend, thousands of computers were attacked by malware called WannaCry, also known as WCry, WannaDecryptOr and WannaCrypt. It’s ransomware and stops you from accessing any files on the ‘infected’ computer until you pay the ransom. NHS computers were infected in the UK by the attack (but not specifically targeted), along with computers in over 100 other countries including those owned by FedEx, Renault and others. It’s a malicious program that’s like a computer virus. It’s designed to scan your hard drives and encrypt as many files as it can so you can’t access them. The files are still there and you have to pay a sum – the ransom – in order to get your files back. This is usually done via Bitcoin, as it’s anonymous. Sometimes, manual human intervention is required of the hackers to decrypt your files once you’ve paid. But since you’re dealing with criminals, there’s no reason to think they will do what they promise. So most experts recommend you don’t pay. There are various viruses or malwares that aim in corrupting your hard drive either to steal information or render it useless. If you aren’t careful enough, you can become a victim of one and end up losing precious files you can no longer replicate. Even modern and sophisticated hard drives don’t stand a chance once the virus, malware, or newer ransomware attacks have gotten into your system. 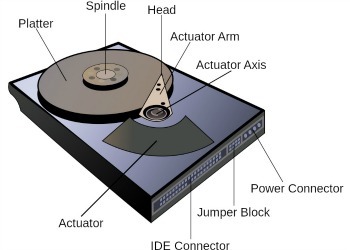 Hard drive failure remains to be one of the most pressing issues when it comes to computer use. Of course, you’d want to save your computer and all its parts whenever possible because it is such an expensive investment but there may come a time when buying a new one is inevitable. So before that happens, make sure you take proper care of your device and stay suspicious of all emails you receive whether a spam or not. Are Macs Susceptible To Virus Too?